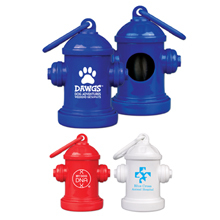 Our Fire Hydrant Bag Holders are a cute giveaway for any dog owner. Just simply strap the clip to your belt buckle or leash and whip out a bag whenever it's time to clean up after your pet. Comes with 15 bags sized at 11 5/8" x 4 3/8". Available in Blue (WL1085X), Red (WL1086X), abd White (WL1087x). The Jumbo Lint Roller is perfect for anyone with pets or a closet of dark clothes! A great item for pet shelters, veterinarians, or clothing stores. Each roller contains 60 sheets. Comes in two colors: Blue (S63053X) and White (S63052X). A perfect item for animal lovers. 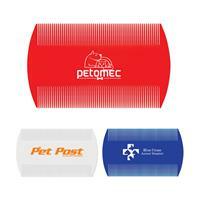 This pet comb is small and handy for grooming your pet's fur to perfection. An ideal giveaway for animal shelter events, veterinarian offices, and pet shops. Available in three colors: Red (S63057X), White (S63059X), and Blue (S63058X). A must have for pet/animal events! This pet food scooper not only helps your pet food stay fresh, but helps you measure servings. A wonderful item to hand out at animal events, pet days, or dog dogs. One location imprint only. 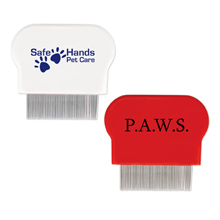 Our dog flea comb is great for pet stores, animal leagues, pet groomers and more. Add your imprint to the comb and hand out at your next event. Available in red and white. Your customers who own pets will appreciate having this lint roller handy. 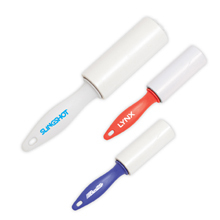 Perfect for pet stores, homes or even in the office, these lint rollers come in your choice of red, white or blue so you can match your promotional tool to your business. Measuring 6 1/4" x 1 1/8", this plastic roller can be customized with your company name and logo to promote your business during your next tradeshow or company event. Each roller contains 20 sheets. Order today! This bone-shaped bag holder is great for pet stores, veterinarians, animal leagues and fundraising events. Comes with 15 bags. Refillable once the bags run out. Available in white (S21078X), blue (S21079X), and red (S21098X). 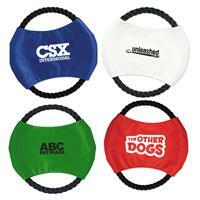 This dog rope throwing toy is great for pet stores, veterinarians, animal leagues and fundraising events. Add your imprint and hand out at your next event. Made of rope and nylon. Available in blue (S50096X) and red (S50097X). One color imprint only. 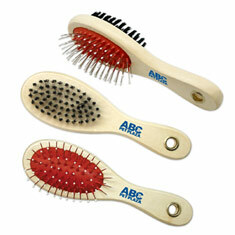 Our dog brush is great for pet stores, animal leagues, pet groomers and more. 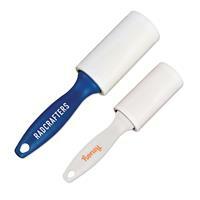 Add your imprint to the handle of the brush and hand out at your next event. 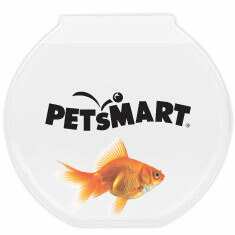 This 12 oz plastic fish bowl is just the right size for carnivals and pet stores. A perfect accessory for pet stores, veterinarians and animal leagues, these pet travel bowls make a great brand-building gift that pet lovers will use whenever they are on he go! 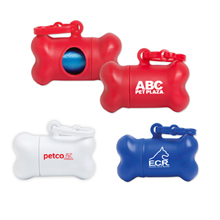 Great for a day at the park or a road trip this polyester dog pet bowl comes in your choice of blue or red to flawlessly match your business. Folds closed for easy storage and use the clip to attach to bags, belt loops and leashes.. Holds approximately 16 oz. Customize the bowl with your company name and logo to effectively build your brand and connect with your customers. Blue Double Pet Bowl made out of plastic. Item Size: 12" x 6" x 2 1/2"; Bowl: 4 3/4" dia..